The axon is a vital part of the motor neuron, which is responsible for conducting action potentials from one part of the spinal cord or brain to another portion. It is an elongated structure extending from the neuron. Without the axon, the neurons will not be able to perform their physiologic functions. These axons come in two types; the axons that render action potentials towards the central nervous system or CNS, and those that conduct them away from the central nervous system. The axon hillock is where the axons leave the cell body. When the body needs them, the formation of collateral axons occur. These are axons resulting from the branching of the original axons. Schwann cells, on the other hand, are neuroglia, which form protective coverings in the form of myelin sheaths. The myelin sheaths insulate the axons and are responsible in stopping almost all electrical flow coming through the membrane of the cell. These neuroglial cells have a variety of functions based on their types. Schwann cells or neurolemma cells, as previously mentioned, are important insulating layers. The astrocytes provide the vital support tissue of the central nervous system. The ependymal cells are found in the cavities of the central nervous system, while the oligodendrocytes contain many dendrites and help in insulating the axon. The last type are the microglial cells, which have the function of eradicating foreign substances like bacteria and cleaning the central nervous system of dirt and debris. 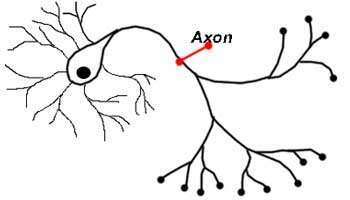 The axon, therefore, can only work efficiently if the other related parts are also functioning well. The central nervous system and all the other body systems cannot act independently from each other. What affects one part of your body will eventually result to reactions of the other body organs.